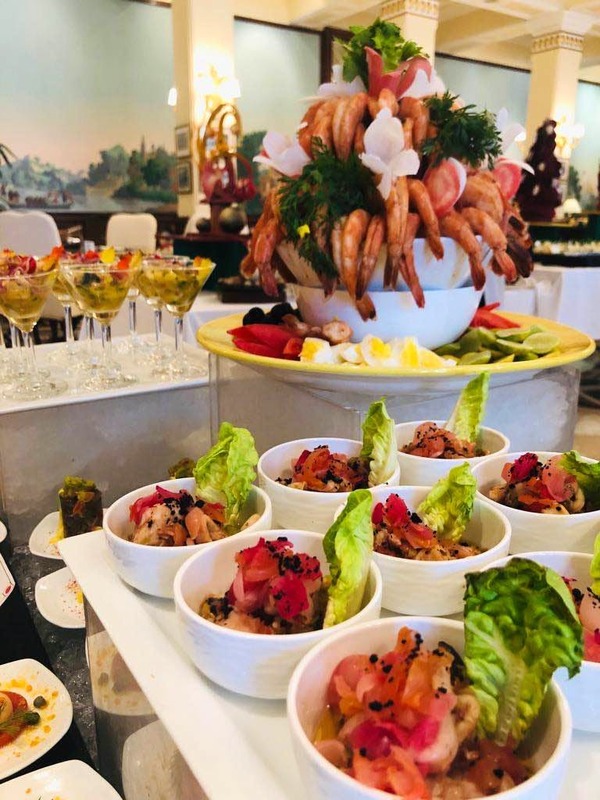 The best thing about buffets is the variety and when you have one at a luxury property then the ballgame changes completely and the spread isn’t just about variety but more about gourmet offerings served as a buffet! If you love buffets as much as I do then don’t miss the Sunday Brunch at 1911 at The Imperial. If the vintage vibe, the timeless décor and the incredible floral arrangements don’t have your heart already then, the food and service certainly will. The ambience is best described as English chic with Indian sense of hospitality, it’s this meeting of two worlds that makes the restaurants at The Imperial impeccable and unforgettable. Since the weather has changed, the afternoon-long buffet has moved back indoors though I suggest you try and get a table at the verandah for a glorious view of the gardens. Start with a selection of antipasti and the Mediterranean mezze selection with a side of sushi if you like. They also have a Live Sunday roast carvery, live grills, the incredible Spanish Churassco and barbecue (seasonal) stations, International cheese selection, International breads including gluten-free options, International selection of hot delicacies including French and Italian classics and finally a fine selection of hot Indian dishes from Pan India that leaves you with unbelievable choices of world cuisine, all under one roof. I suggest you go crazy over the grills but keep space for the Dal Imperial and hope that they have the Lamb Shanks the day you visit, despite this insane variety, you’ll come out with a few favourites that you wish keeps getting repeated but be warned, they change their buffet week on week! The important point to note in all this indulgence is that almost 80% of the produce they use is natural or organic! For light eaters, there is a display of raw seafood and fish like Rainbow trout, clams, mussels, squids, perch, mackerel, scallops cooked as per your liking (steamed, baked, grilled etc.) Individually done starters and salads in small portions are specially crafted for those who prefer leaner meals. Since the quality of the home cured and preserved cold meats, smoked duck and smoked salmon are of premium quality, they certainly qualify as healthy eating, though being a Sunday, do try and indulge, especially since they have a live counter for handmade pasta. In case this wasn’t enough or like me, you believe there is a separate stomach for dessert then go ahead and check out the dessert counter that boasts of cupcakes and vegan ice creams, sugar-free desserts, French pastries like Macarons, Eclairs, mille-feuille and more! It’s The Imperial .. it cant get better than that! !